Sun and warmth tempted us out of our winter coats today! I used the opportunity to freshen this $1 wreath. I wired several pinecones to its frame (finally using some of our stockpile!). Then, I experimented with my 59-cent EZ BowMaker from the thrift store, using a 50-cent roll of yard sale ribbon. 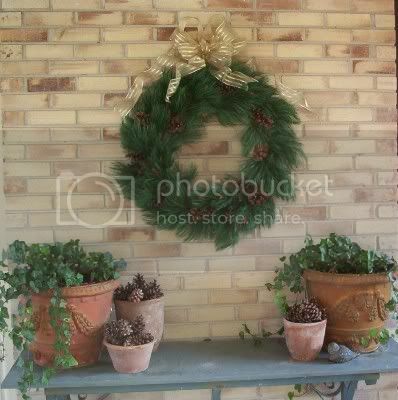 I like the natural effect the greens, browns, and terra cotta create. Underplanting your summer pots with English ivy is another frugal trick; when annual blooms are gone, the evergreen vines remain. The pots are all curbside finds. I bought the slate-topped buffet for $10 at yet another yard sale. Pretty and Festive! I've been decorating with lots of greens too! Freebies from the tree cutting area at Lowe's - I'll be posting on it soon.